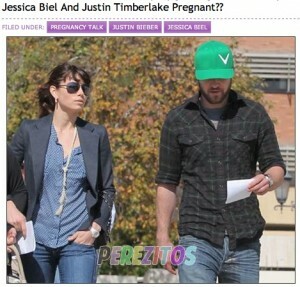 “Jessica Biel And Justin Timberlake Pregnant? ?” asks Perez Hilton on his equally unreliable sister site Perezitos. And while it would be nice for them to be expecting, a source close to Timberlake assures Gossip Cop that the blogger’s story is “not true,” and that they are not having a baby now. Once again, the only thing fertile here is Perez’s imagination.